As the war rages over Earth, more Alien factions join the conflict, unleashing powerful new technologies and deadly new battle tactics. Enlisting the services of several fiendish Alien warlords, the armada calls in the ultimate galactic destroyer, the Apocalypse Cube. Sweeping across the planet, waves of alien saucers fight to control land, air and sea, but the Human resistance has one more trick up their sleeve. Bringing to bear the full force of the battle hardened Navy to defend the coastlines and waterways of their world, powerful Battleships and Destroyers clash with the Alien invaders. Even with massive warships, new atomic power plants, and developing technologies though, the Humans may find that their final moments are at hand... the Apocalypse. 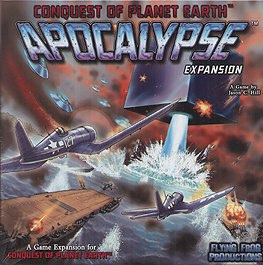 Conquest of Planet Earth: Apocalypse is an exciting expansion for Conquest of Planet Earth, The Space Alien Game. It includes game boards, miniatures, counters, and rules that allow more people to play in the game, increasing the maximum number of players to six. Apocalypse also features four new alien races, including the alluring Selenian Sirens, the Qua'to Industrial Unification, a dual race - the Kazak-Zelos Federation, and the dome-helmeted Martian Confederacy. Four powerful new Alien Allies join the battle including Queen Adora's Floating Palace, Taskmaster Kol's Warbeast, the Kruxx Heavy Tank, and the massive Apocalypse Cube. All of the game decks from Conquest of Planet Earth are expanded in Apocalypse, plus the all new Coastal Resistance deck brings the US Navy to the defence of Earth. And, veteran players will love the challenge and fast-pace of the new Brutal Game setup.